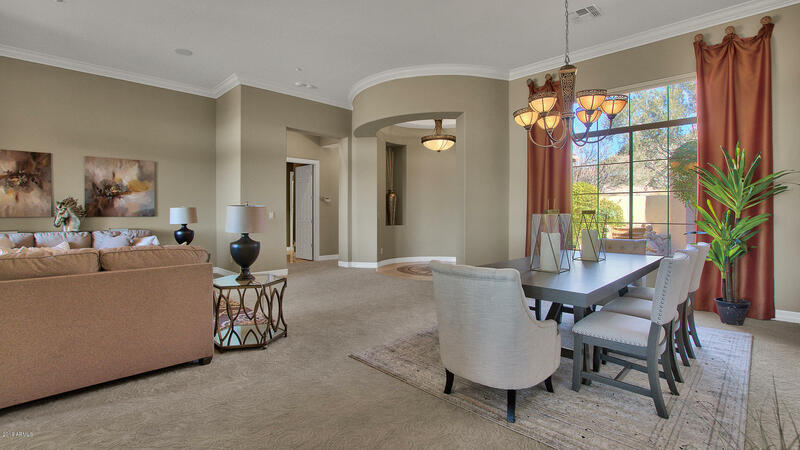 Welcome home to this beautiful 3 bedroom, 3.5 bath Brentwood model featuring over 3,600 square feet of luxury living. 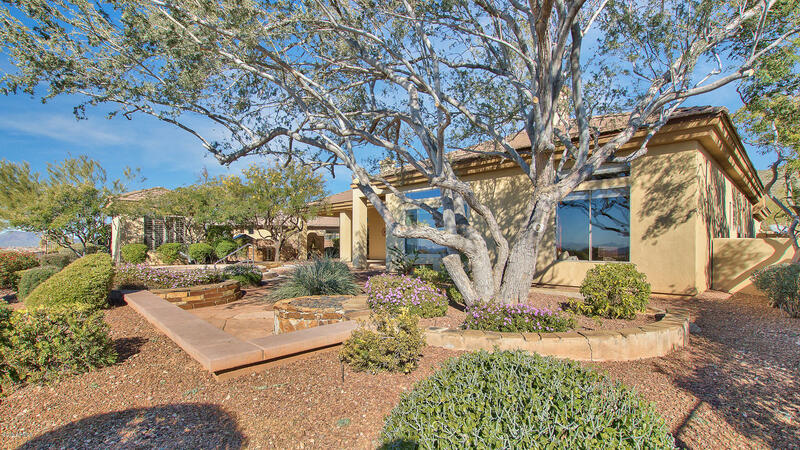 This property hits all the marks... prestigious guard-gated Anthem Country Club, former model home with upgraded finishes, premium elevated golf course view lot, mountain and city light views, and a short drive to the golf and country club with dining room, community pool and hot tub, gym, and other fine amenities. 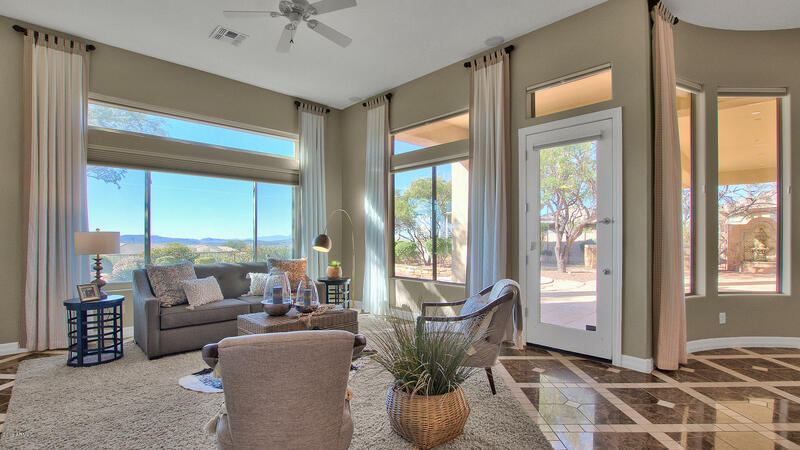 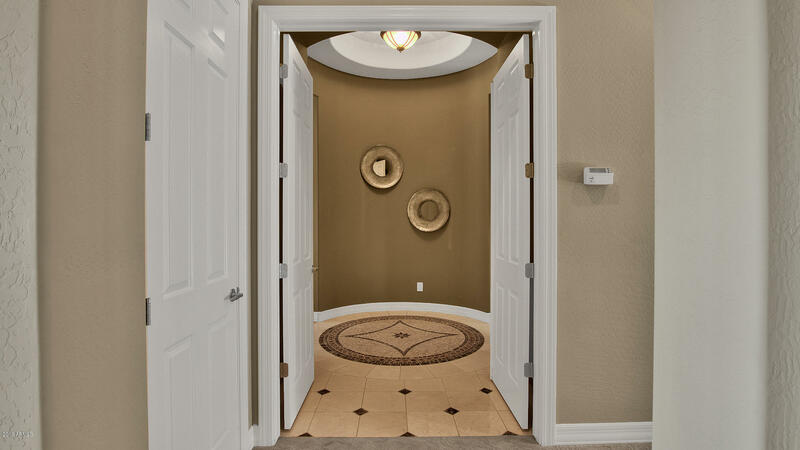 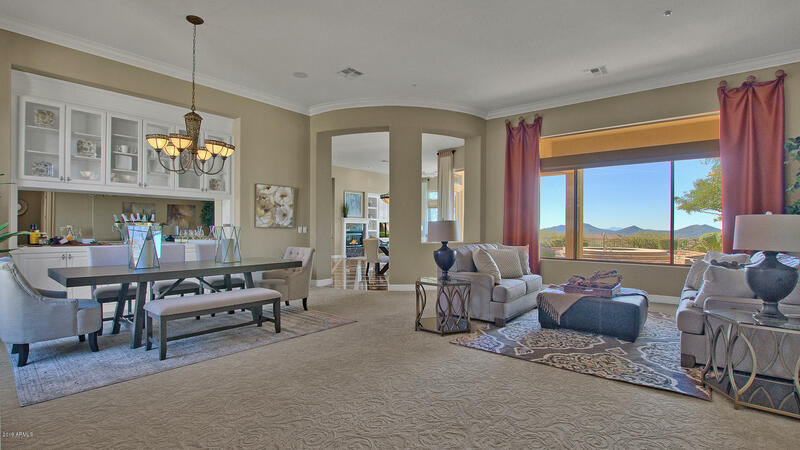 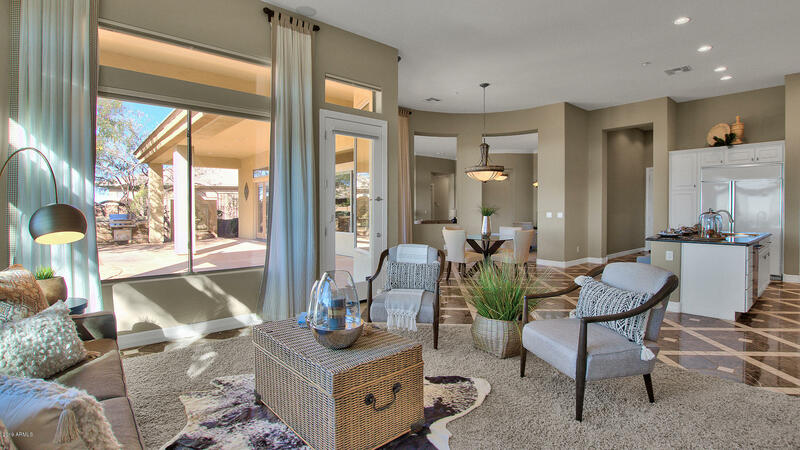 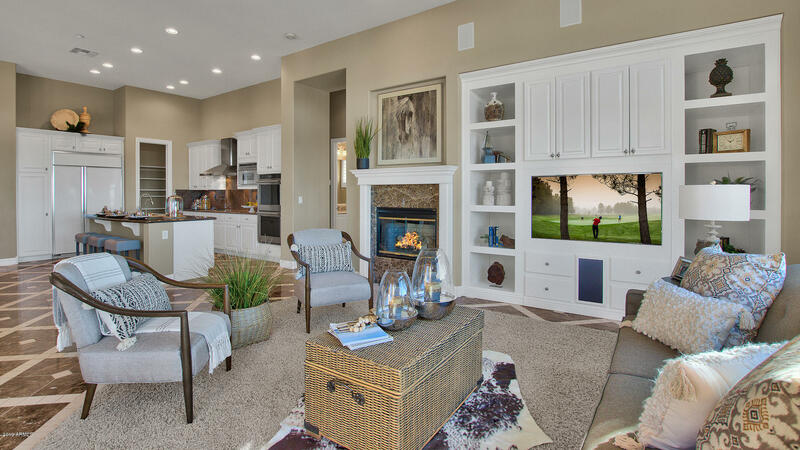 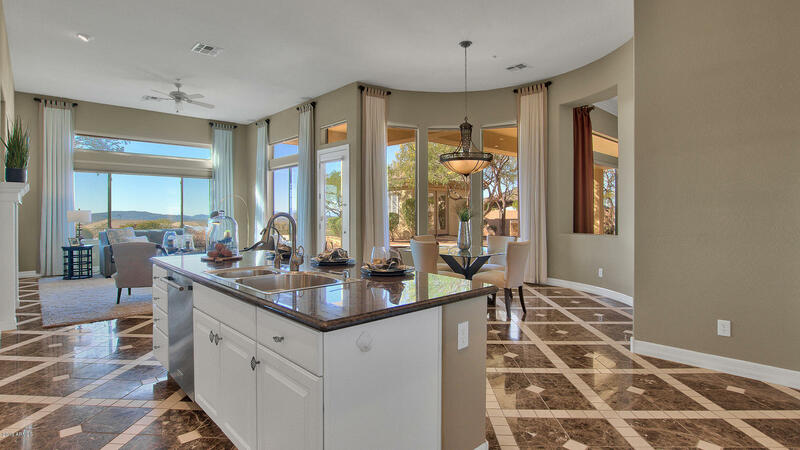 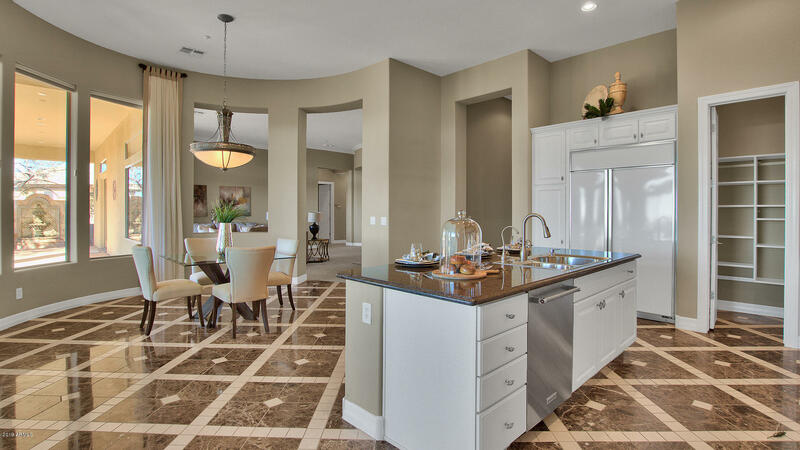 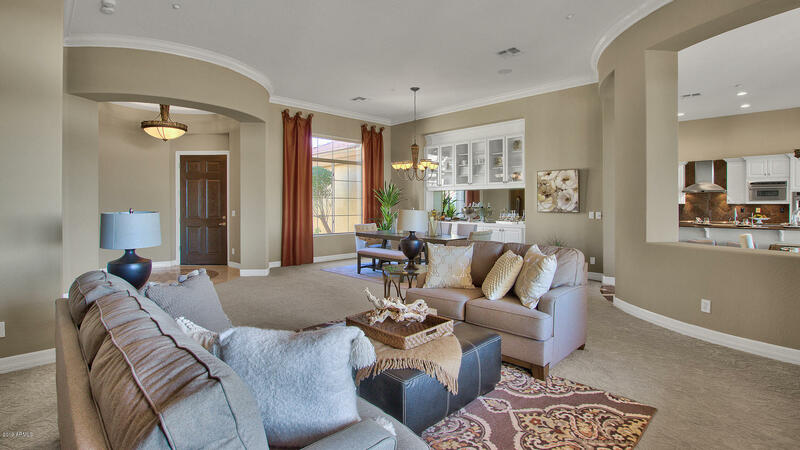 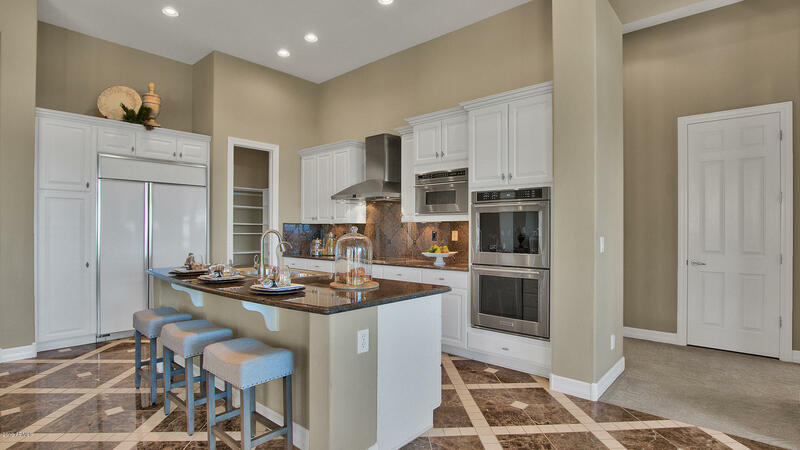 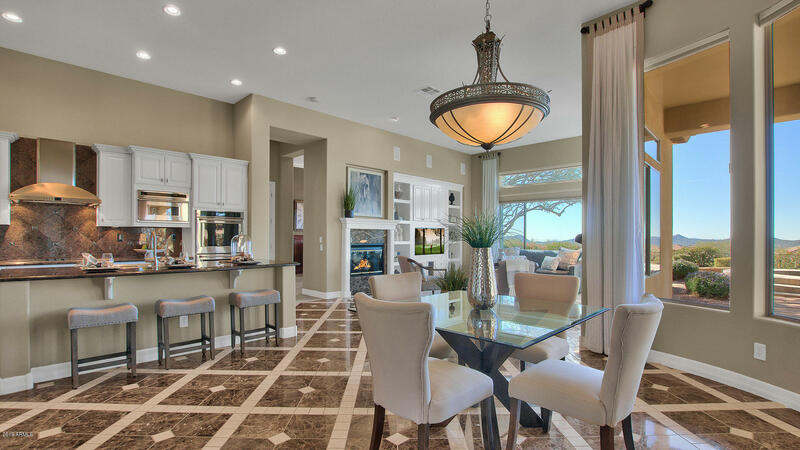 From the moment you walk in you are greeted by a spacious open floor plan, luxury finishes, and gorgeous views. 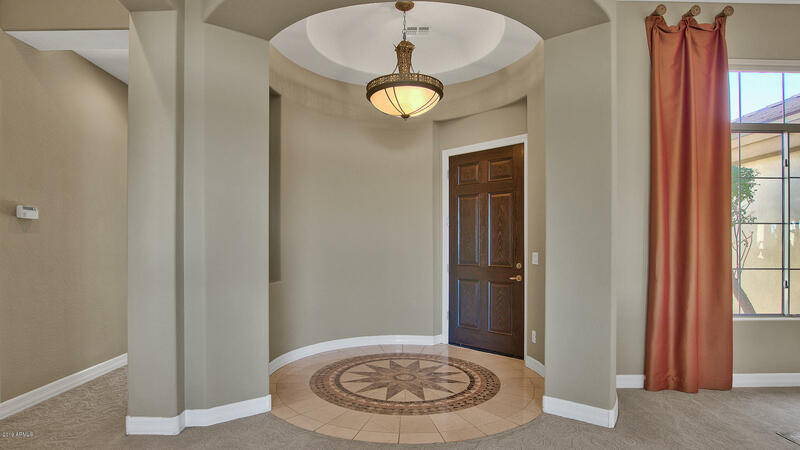 As you enter the rotunda of this popular Brentwood floor plan, you are welcomed by a formal living room and dining room with large windows that showcase the great views from this elevated golf course lot. 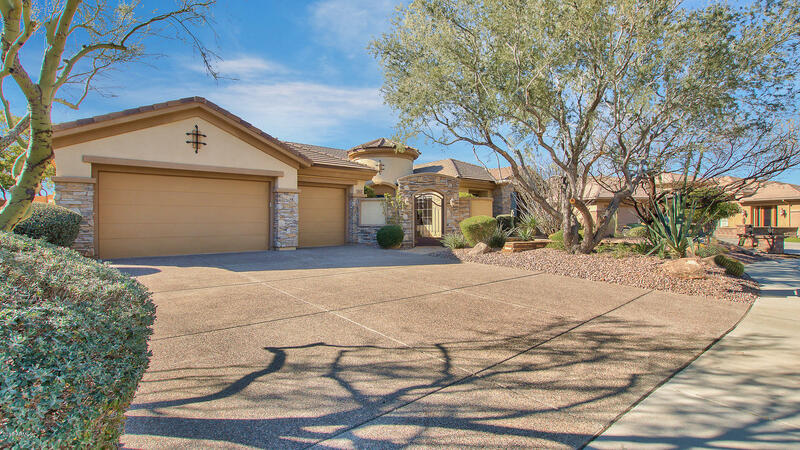 A new roof was installed in 2016. 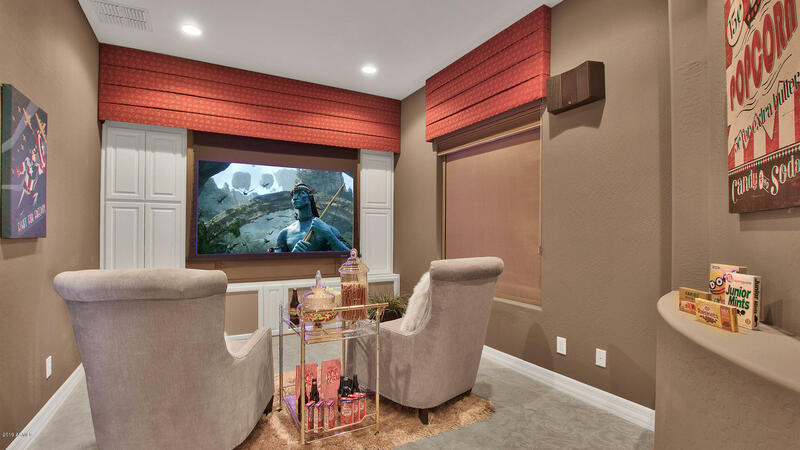 To the right is the home's theatre room with projector, electronic screen, and electric blackout blinds. 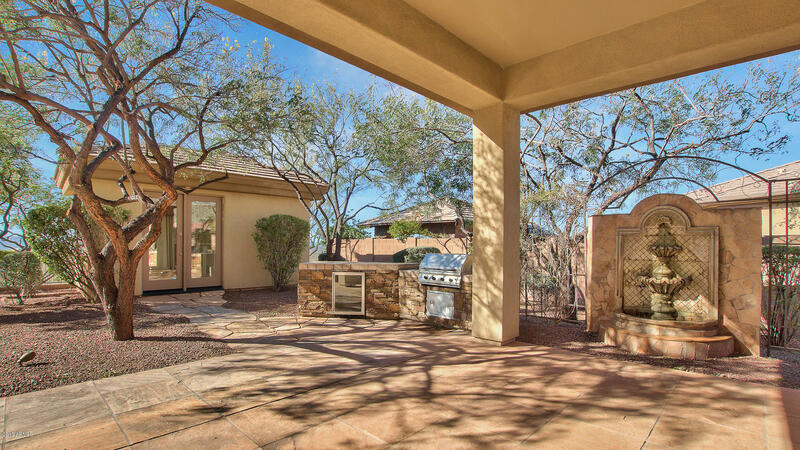 To the left is the family room with custom built-ins, a cozy gas fireplace with excellent storage for books and TV components, and in-ceiling surround sound speakers plus more beautiful views and access to the large covered back patio. 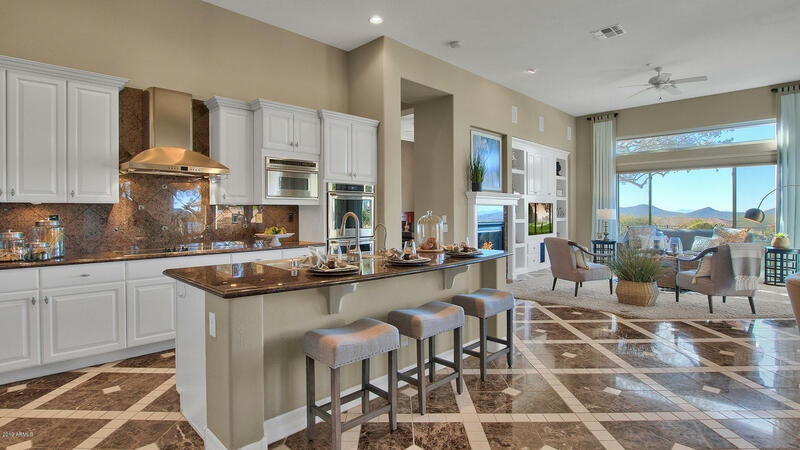 Off the family room is a breakfast nook and spacious kitchen with granite countertops, a large island with plenty of bar seating, a walk-in pantry, and upgraded appliances. 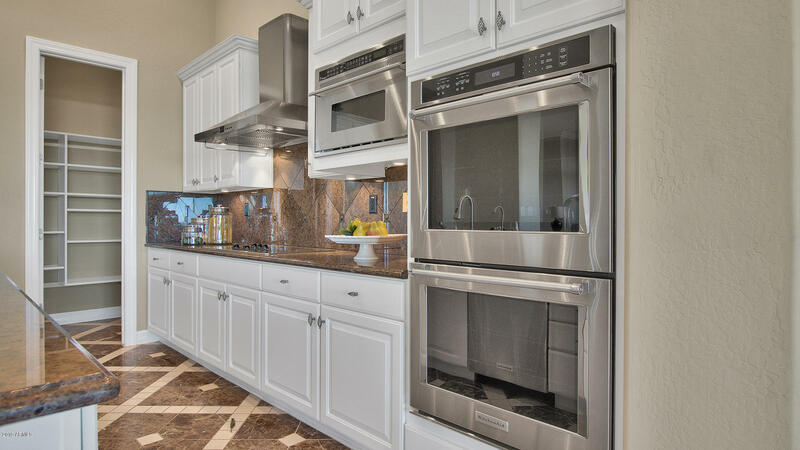 KitchenAid double ovens installed last year. 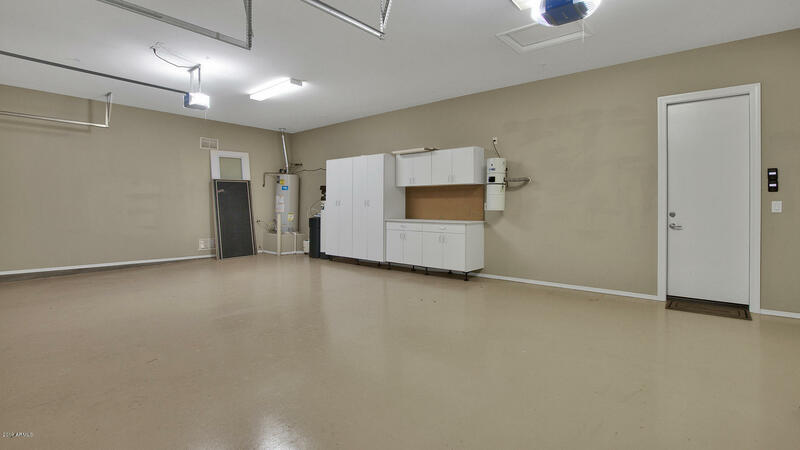 Refrigerator/freezer is a professional SubZero. 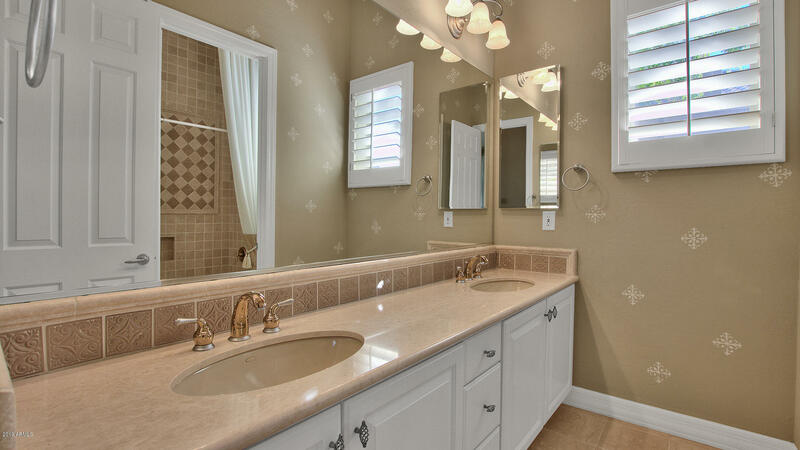 New RO filtered drinking water is located at the kitchen sink. 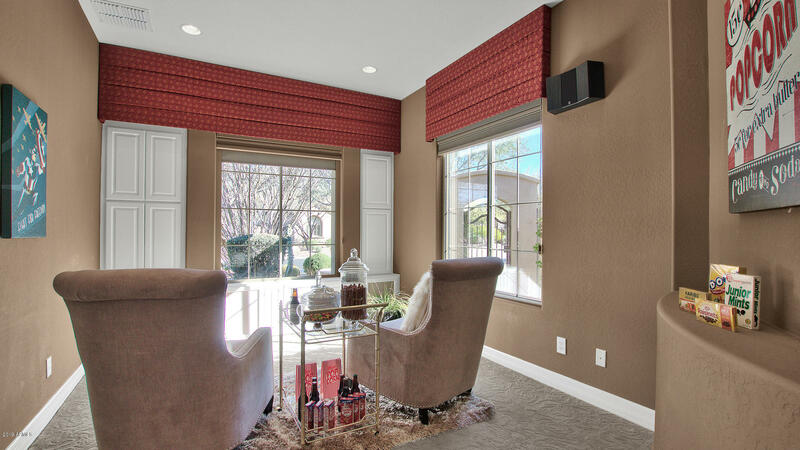 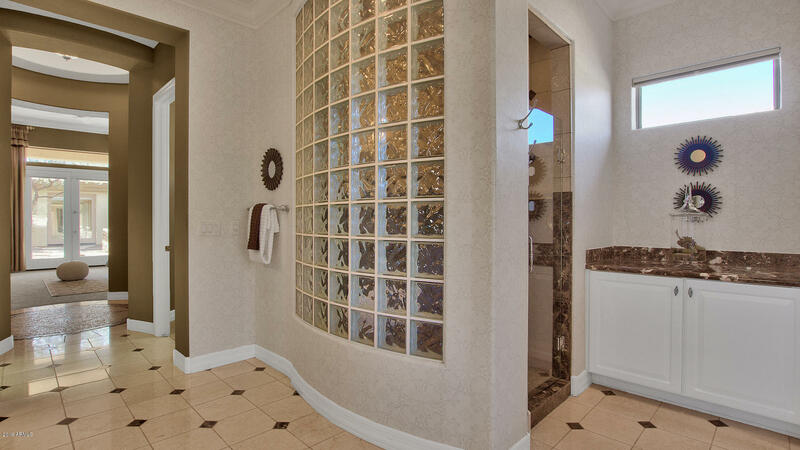 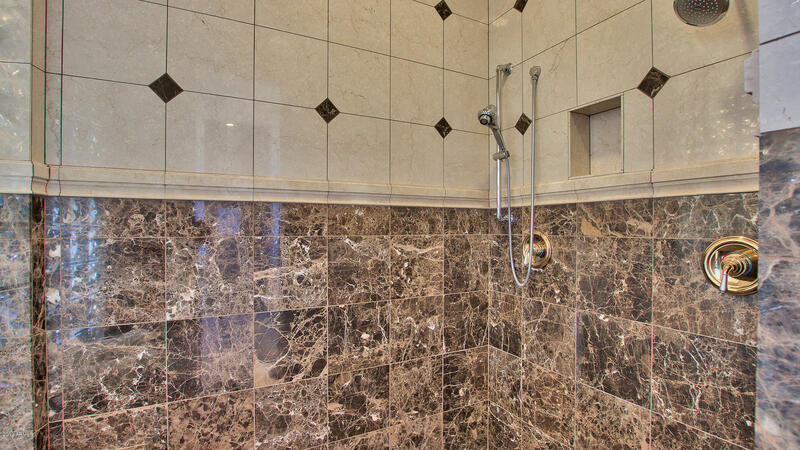 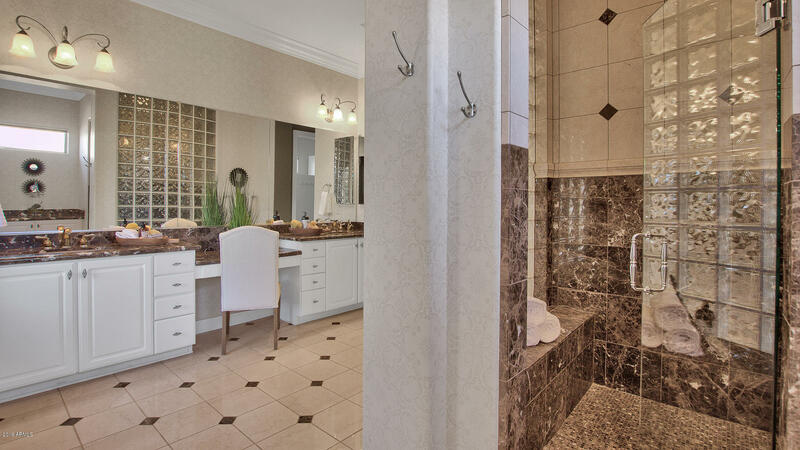 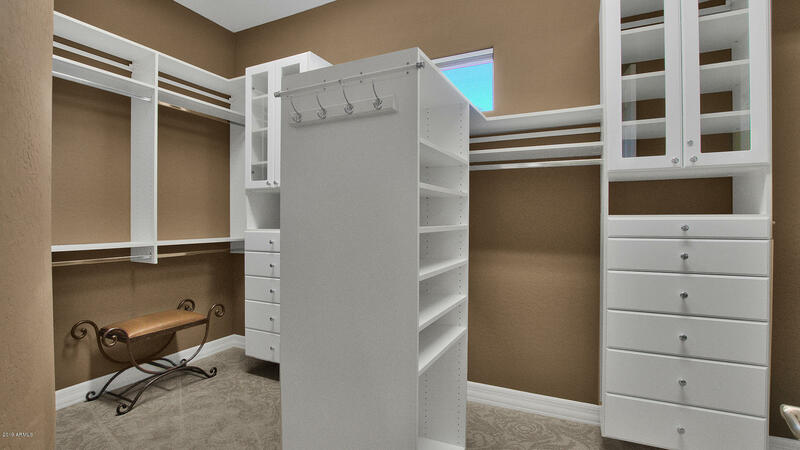 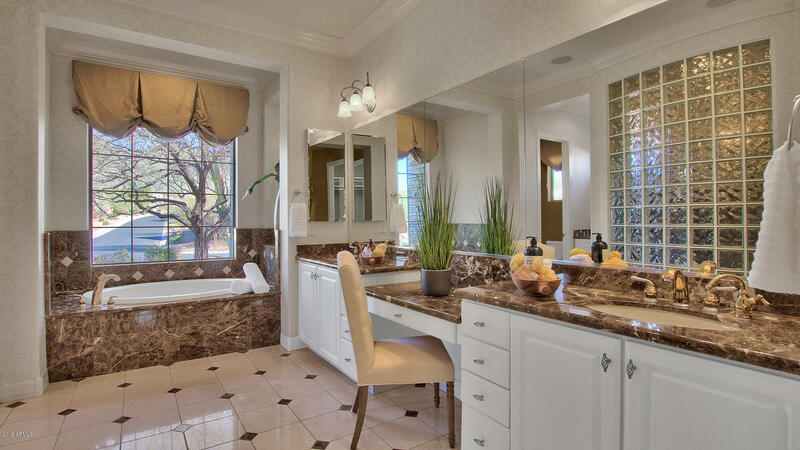 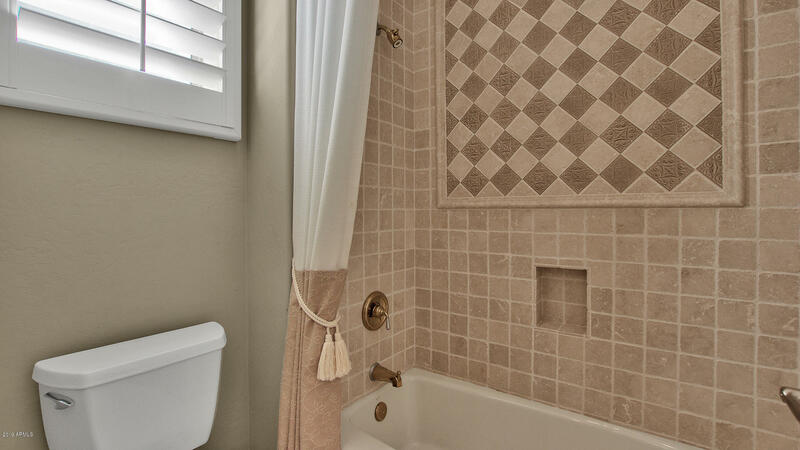 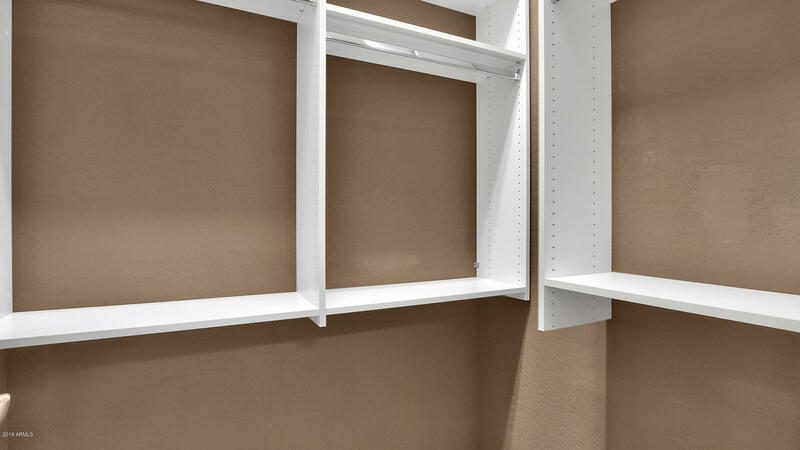 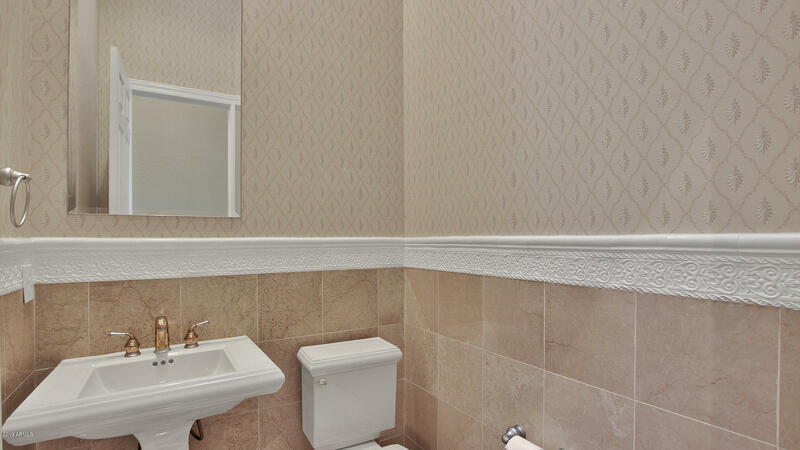 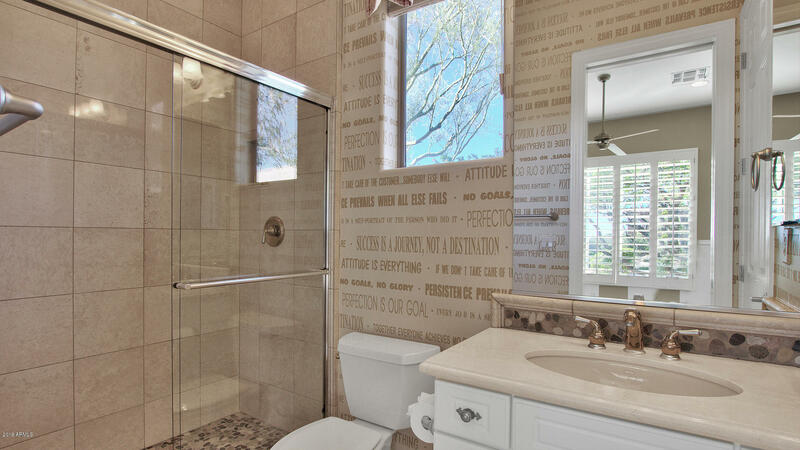 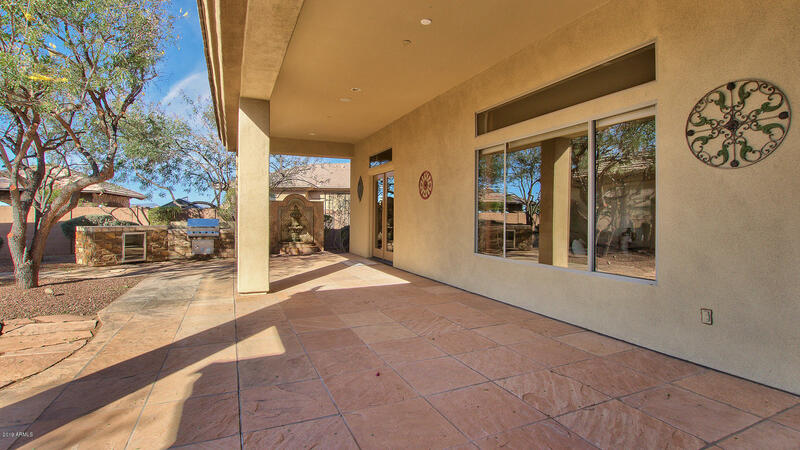 On this side of the home is a powder room, laundry room, office, a bedroom with a full bathroom, and access to the home's three car attached garage with built-in storage cabinets and home to the whole home in-wall vacuum system. 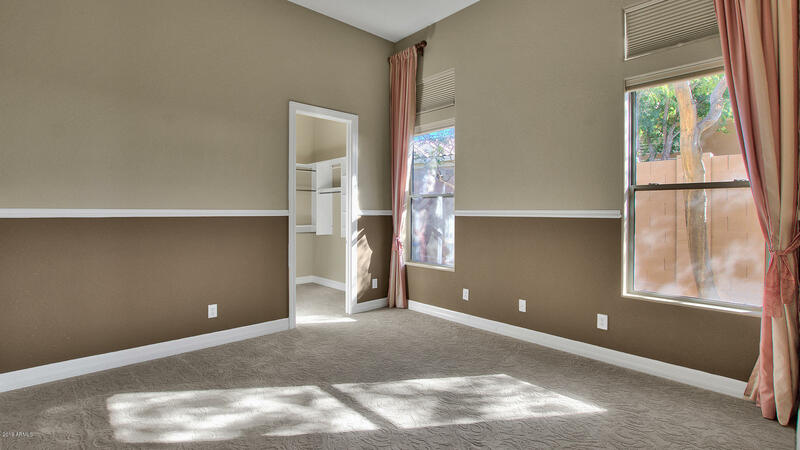 The office could be converted to an additional bedroom if desired. 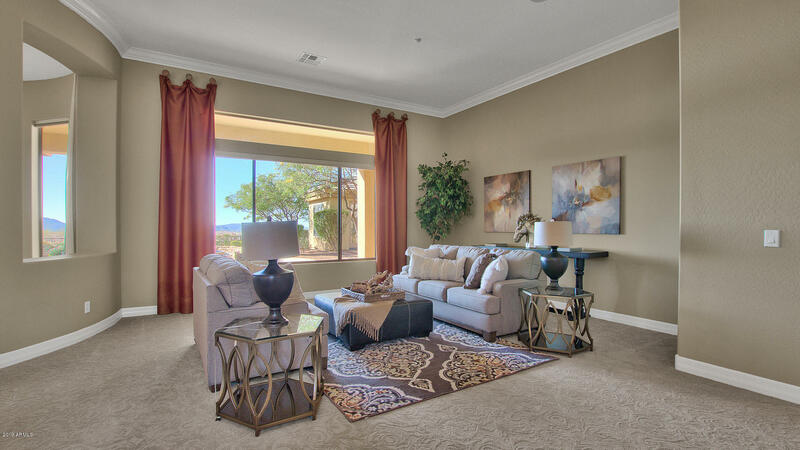 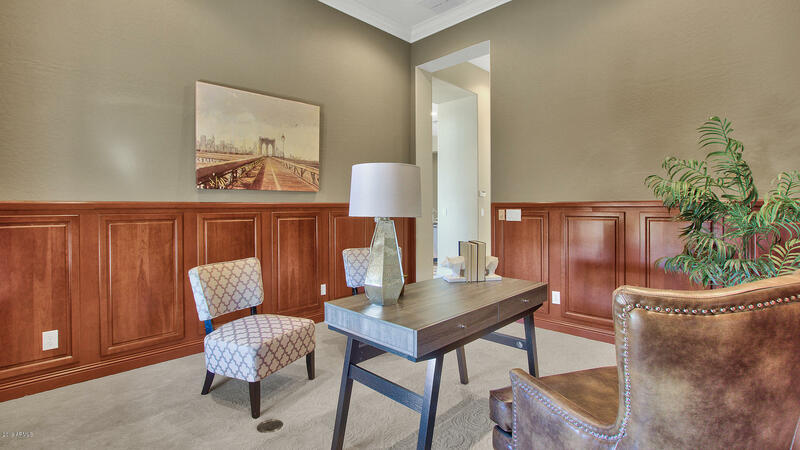 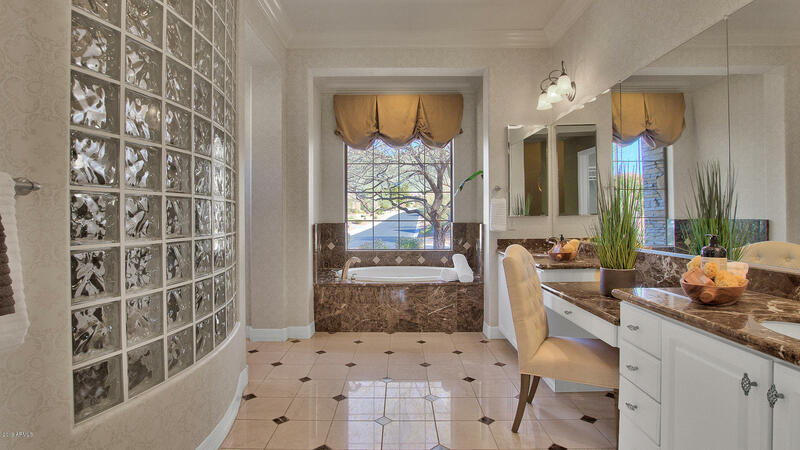 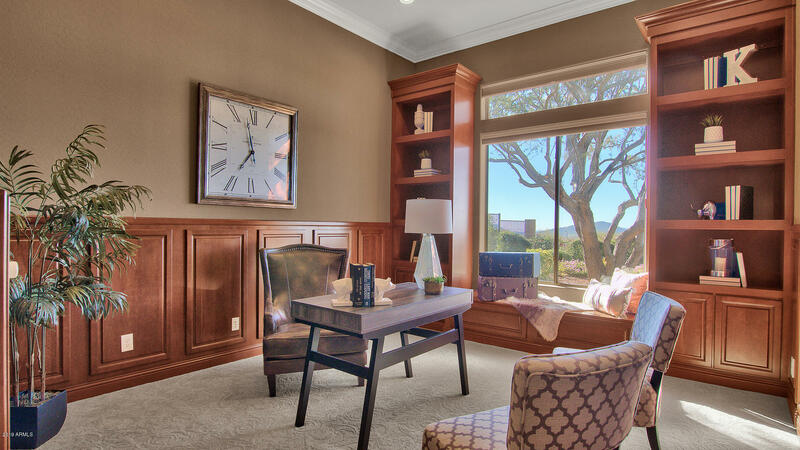 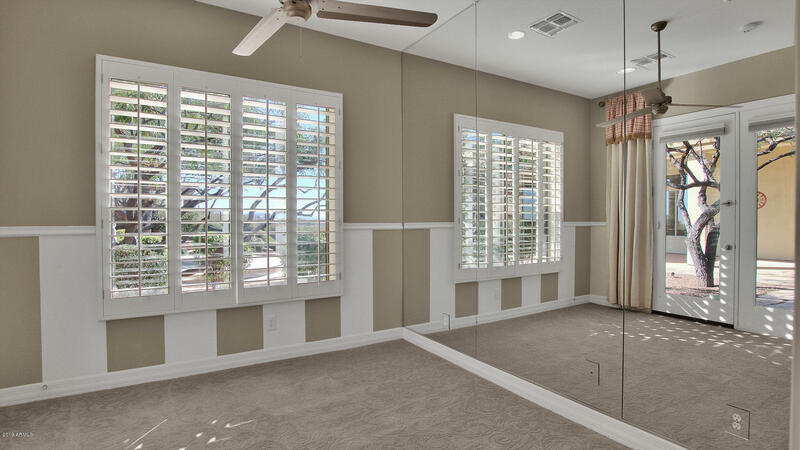 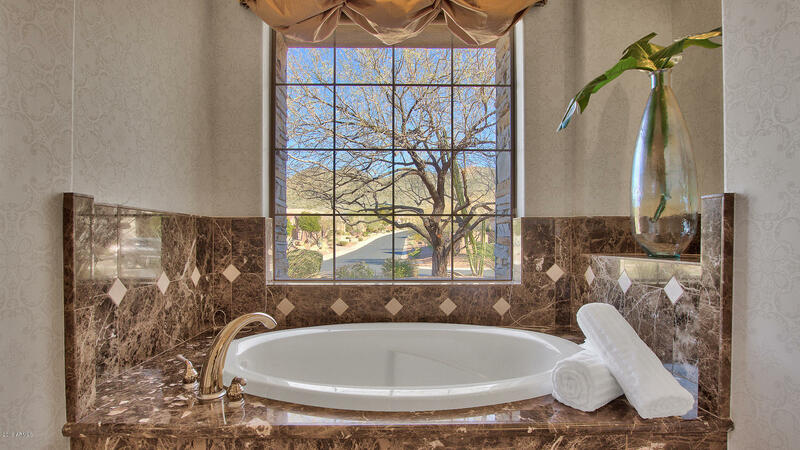 Located on the other side of the home and split from the second bedroom is the grand master suite. 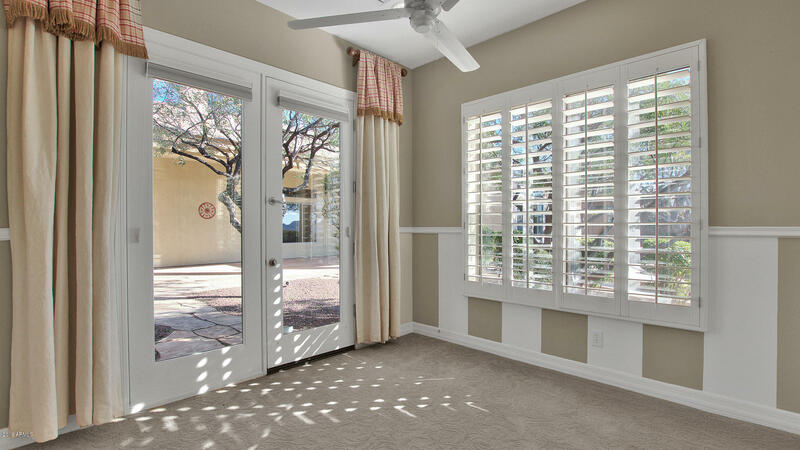 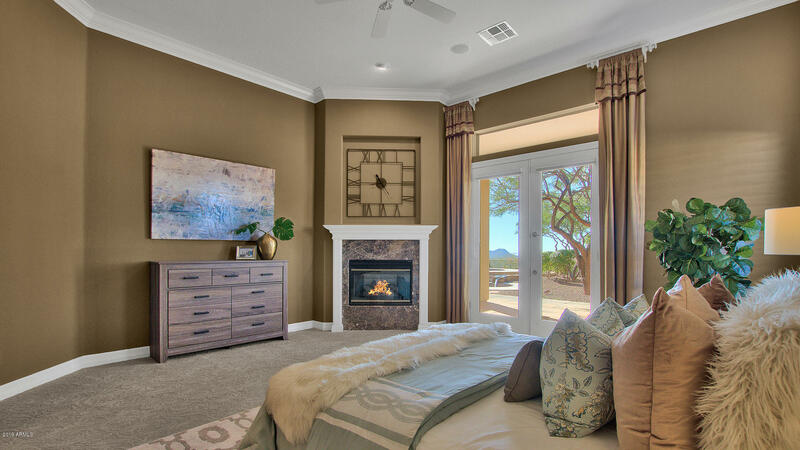 Through the double-doors, you enter a spacious bedroom with cozy gas fireplace and french doors to the backyard as well as a spa-like bathroom with dual vanities, large soaker tub, large walk-in tiled shower, and dual walk-in closets... this is the ideal master retreat! 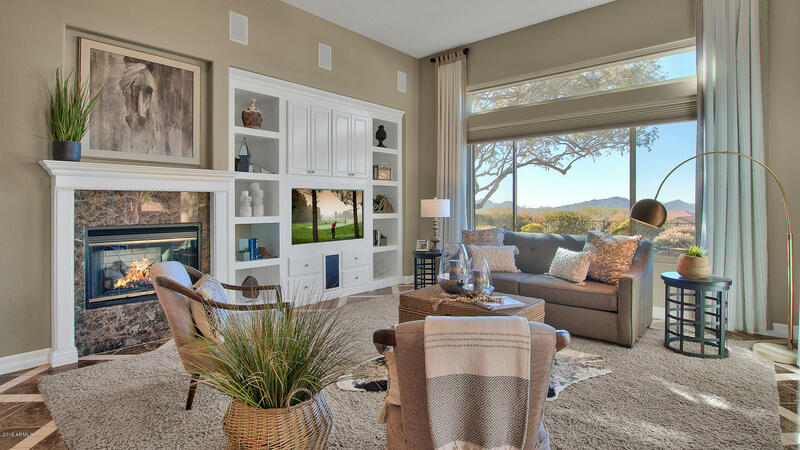 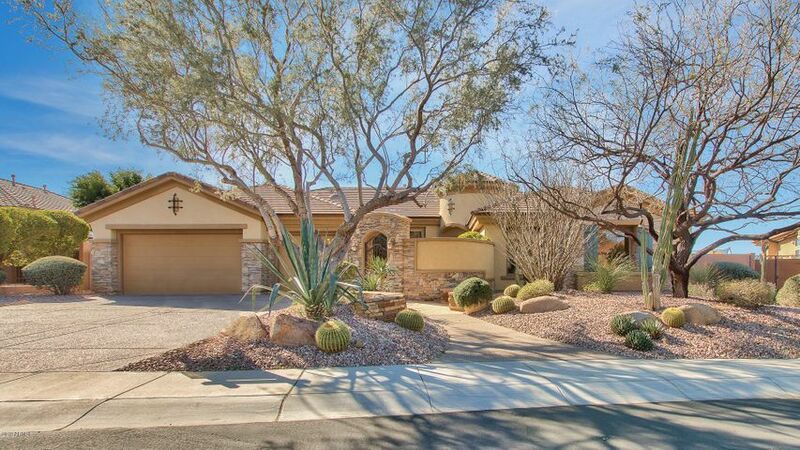 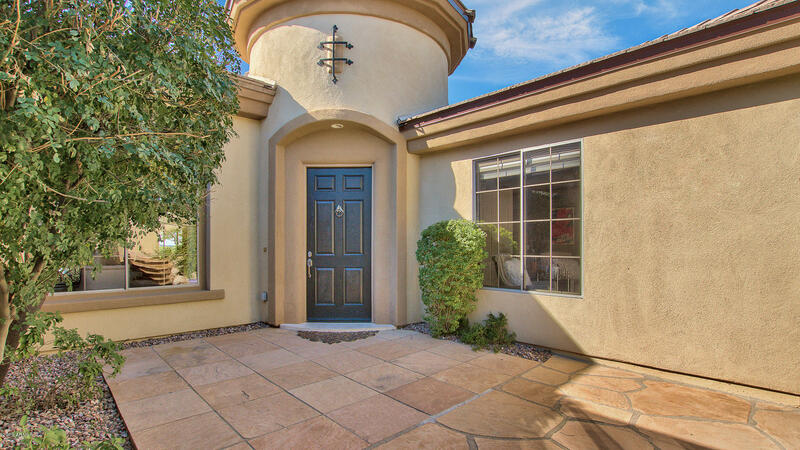 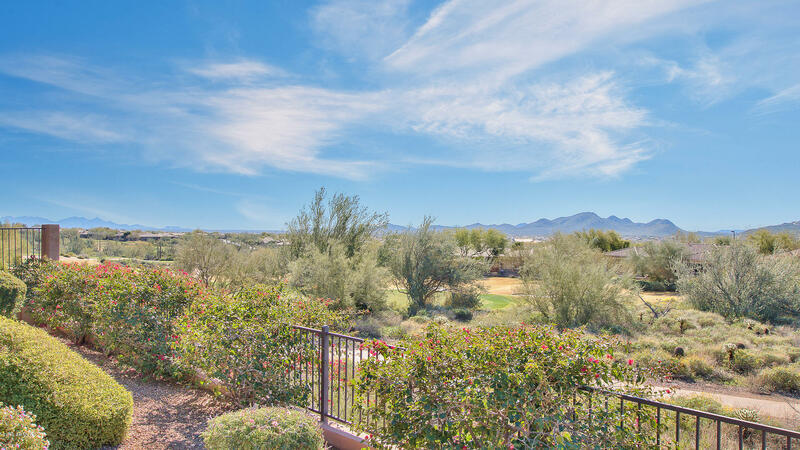 This former model home sits on a premium elevated golf course view lot. 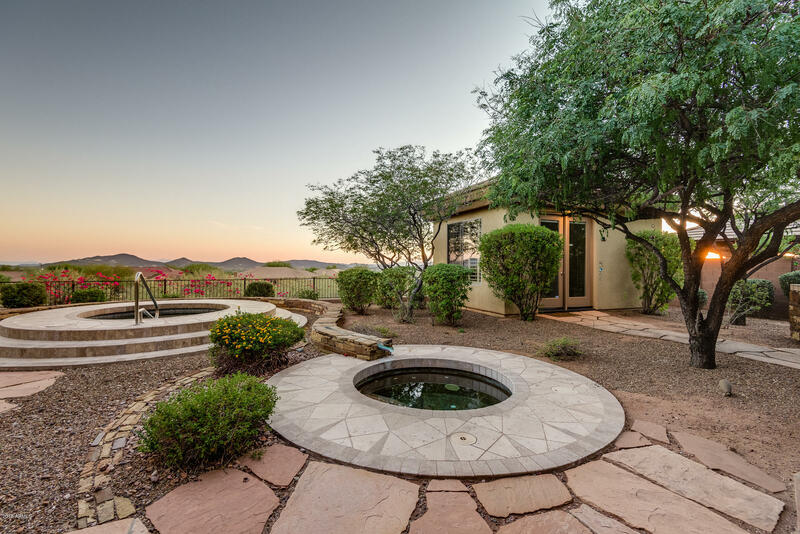 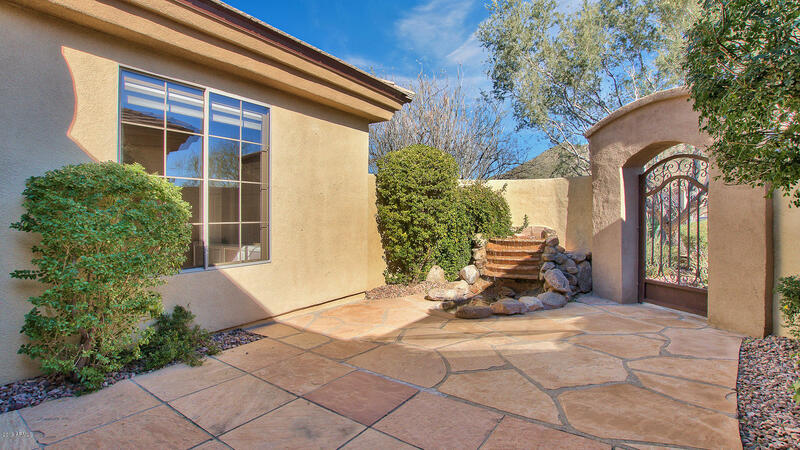 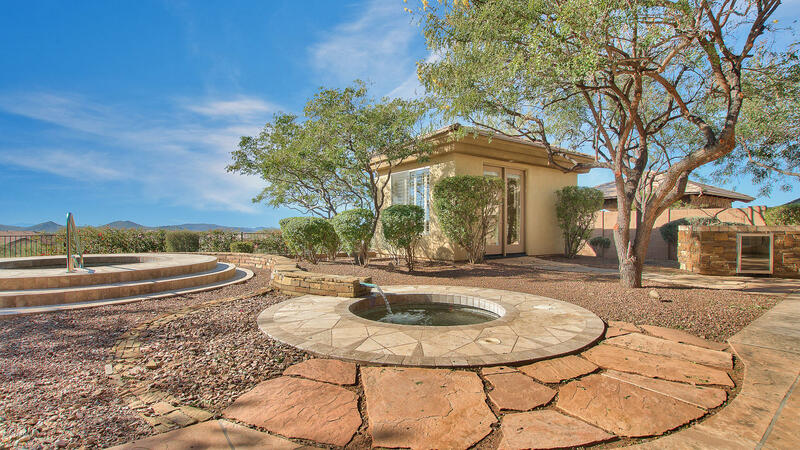 The backyard features a gas heated spa, plunge pool with water feature, and a casita with the home's third bedroom and third full bathroom. 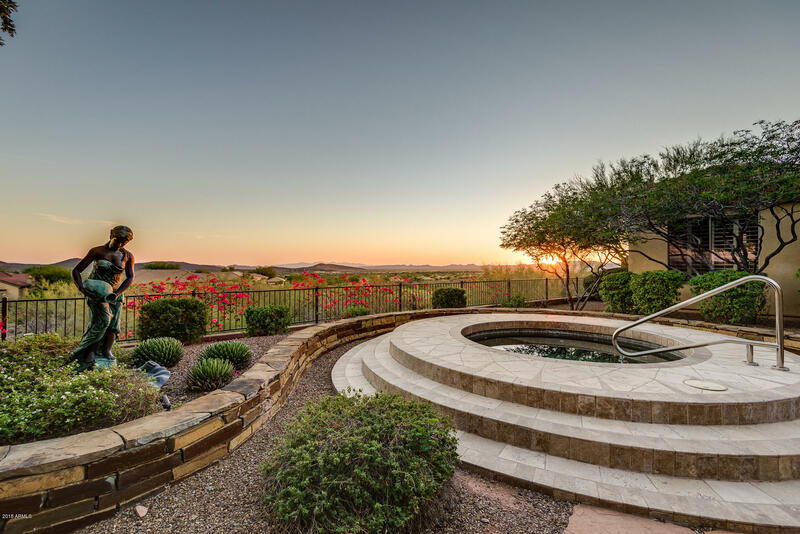 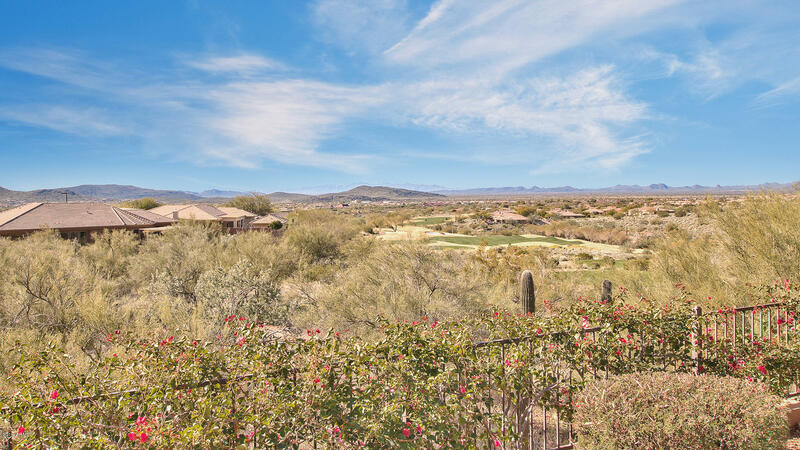 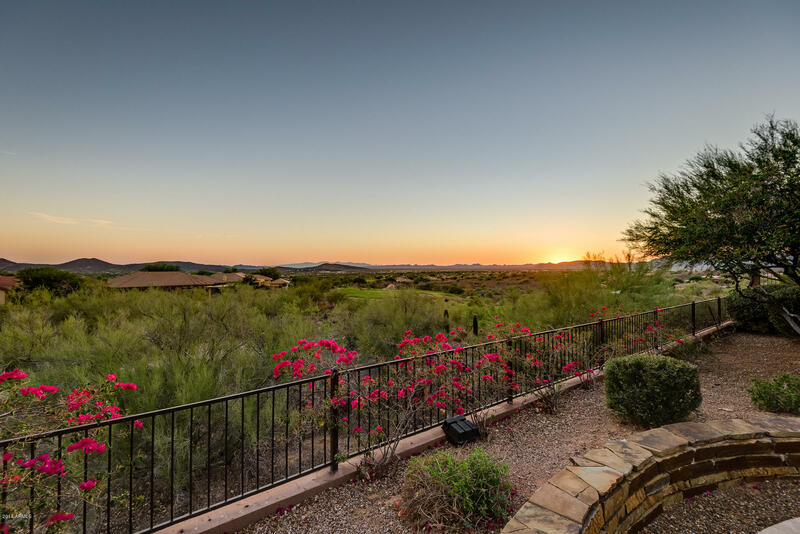 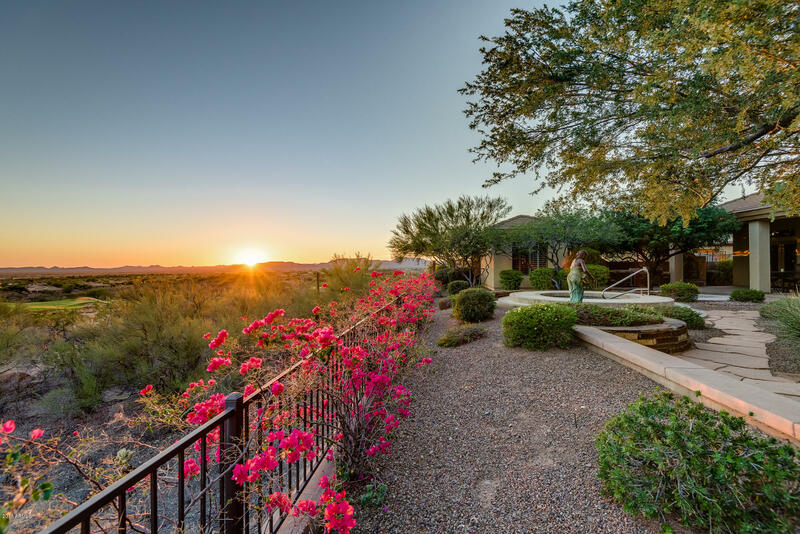 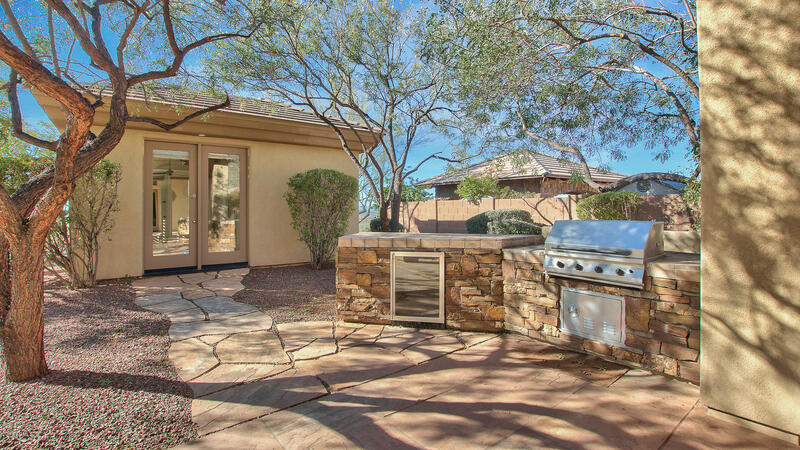 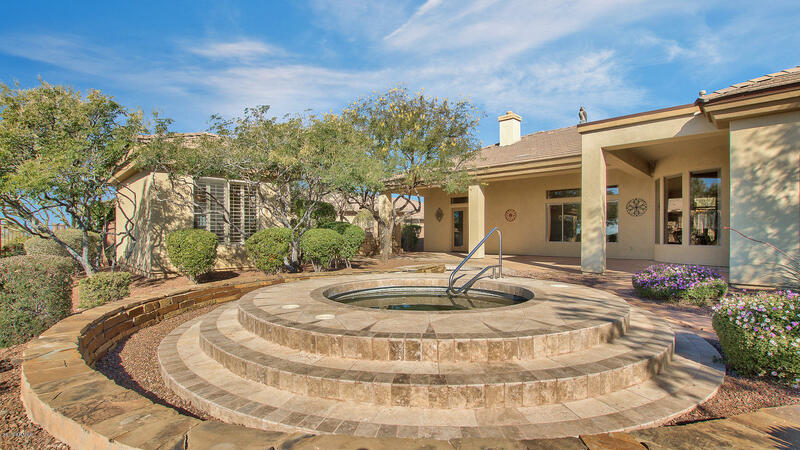 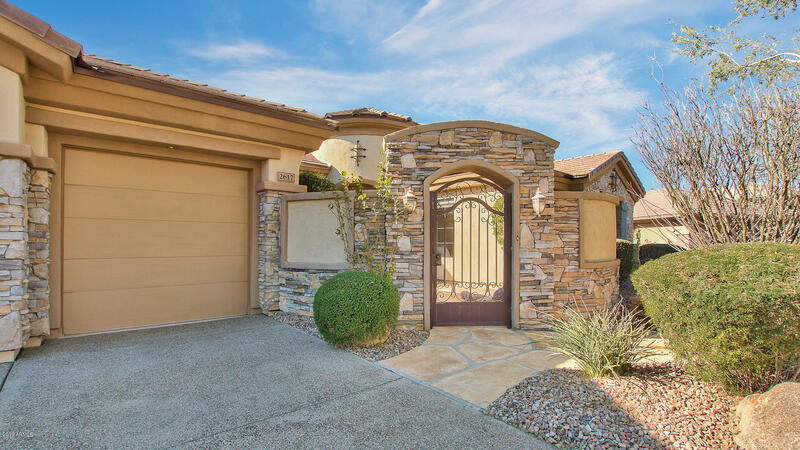 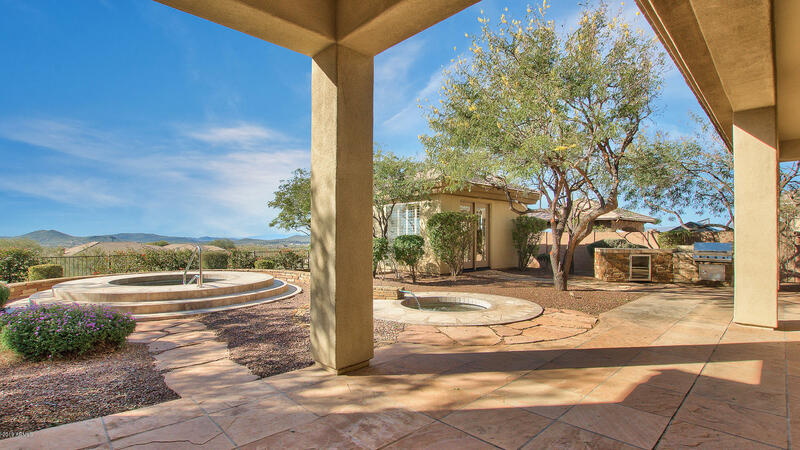 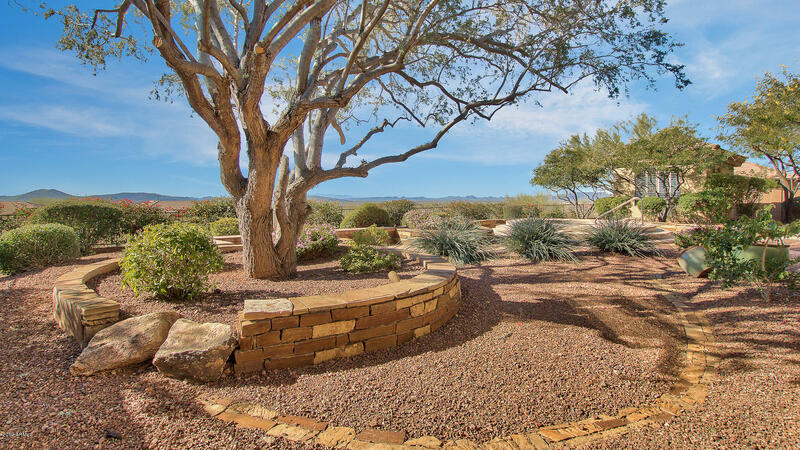 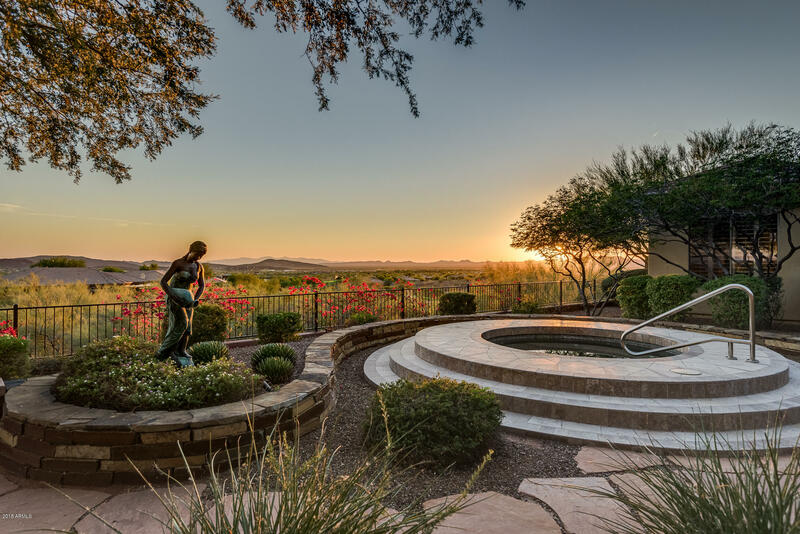 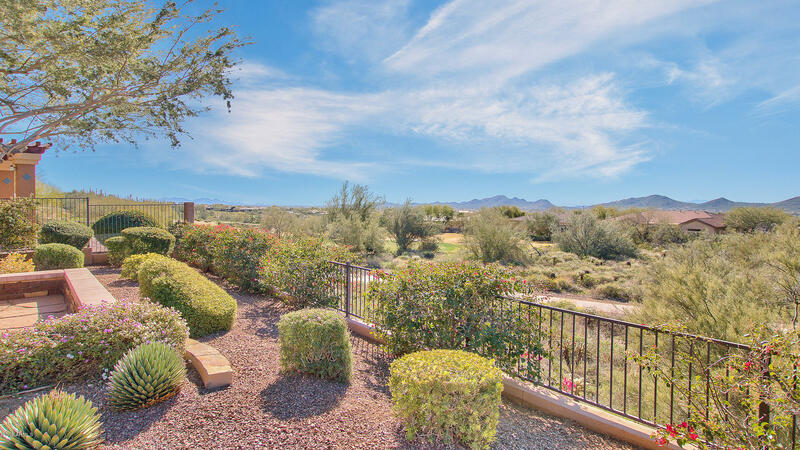 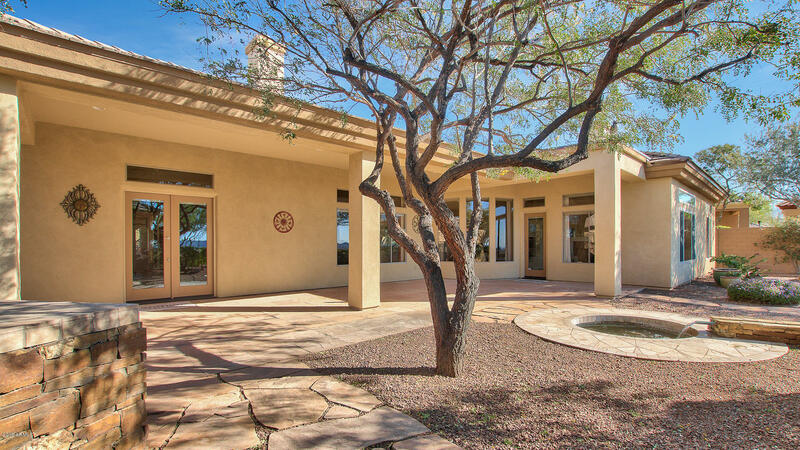 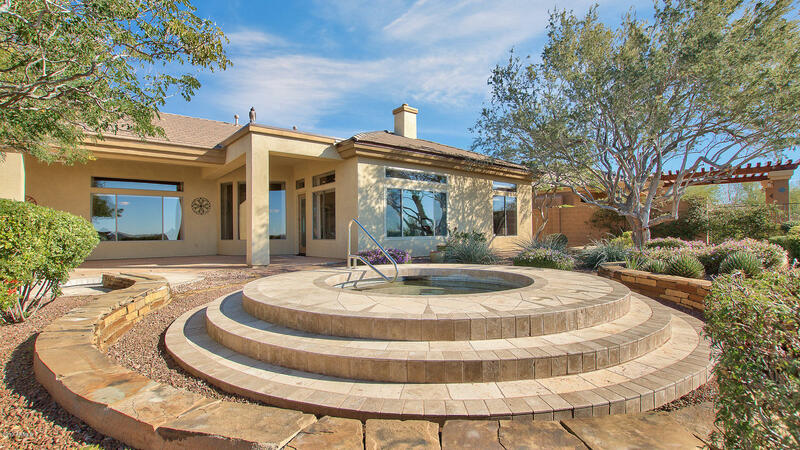 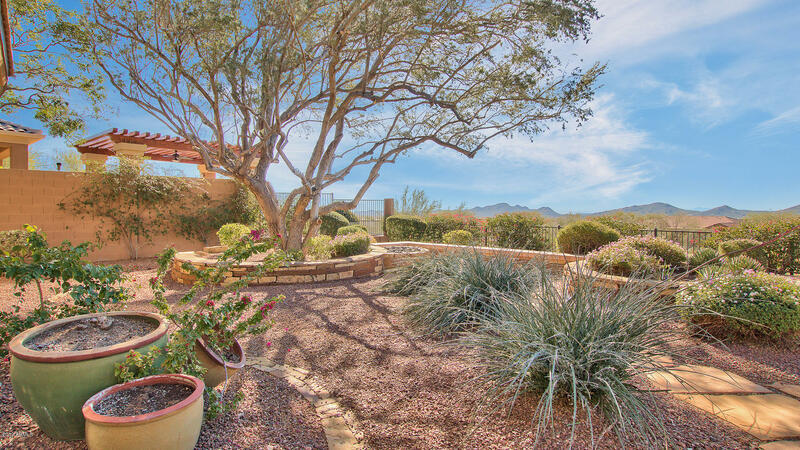 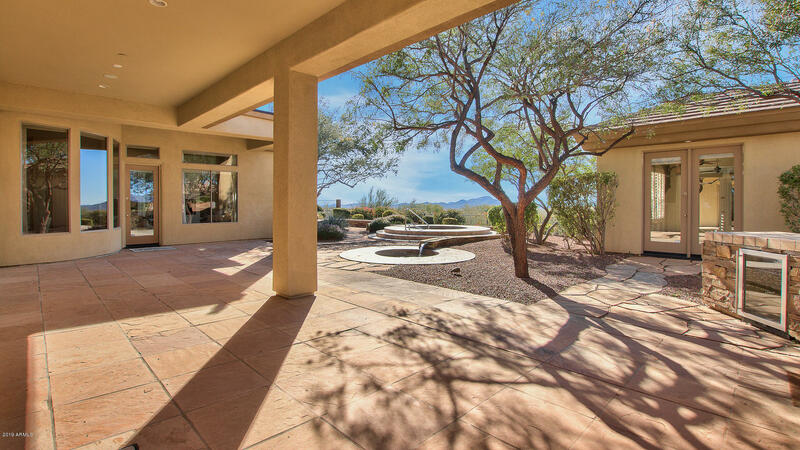 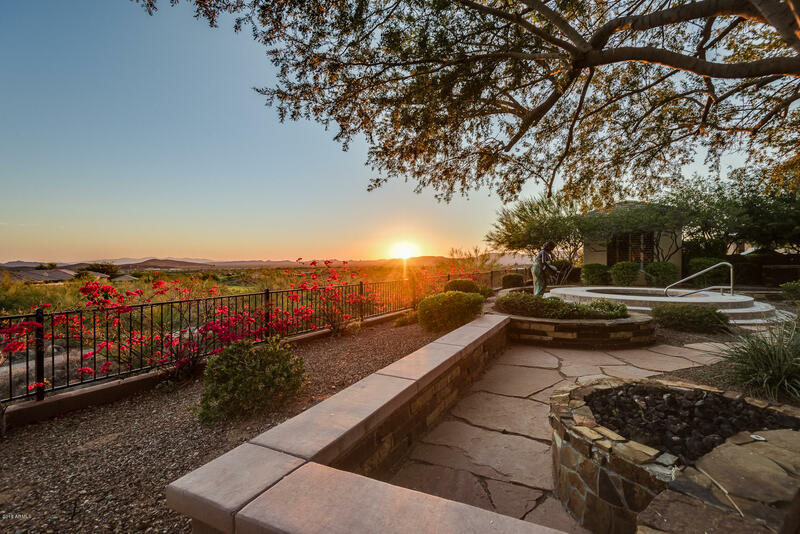 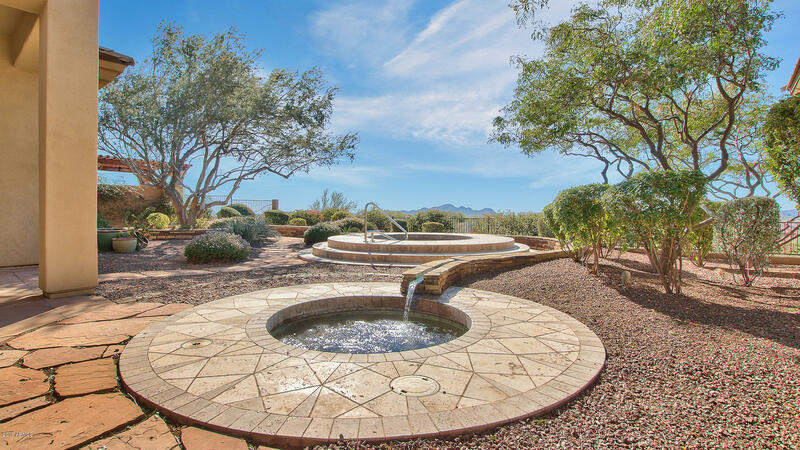 With gorgeous golf course and mountain views, this large and private space is great for entertaining and enjoying the beautiful Arizona desert.